Let's kick off the new year with some French cinema, The Nun aka La Religieuse, arrives on DVD this coming 10th February. Directed by Guillaume Nicloux it stars Pauline Etienne, Isabelle Huppert and Louise Bourgoin. Alas, details beyond the above are sketchy, all we can tell you are it comes with a 15 certificate and is based on the eponymous 18th century novel by Denis Diderot. France, in the 1760s. Born into a bourgeois family, Suzanne is a beautiful young girl with a natural talent for music. Despite her faith, she is dismayed when her parents send her off to a convent, expecting her to become a nun. 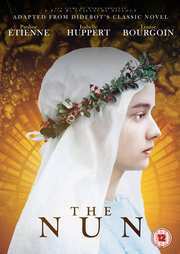 Suzanne first resists the rules of the convent, but soon finds out that she is an illegitimate child, leaving her no other option than to pronounce her vows and suffer the consequences of her mother’s sin.